Stunningly sensational! Ladies and gentlemen, children of all ages witness the larger than life movie musical adaptation of the life of P.T. Barnum directed by Michael Gracey. Dazzling! 20th Century Fox’s The Greatest Showman is an incredible work of motion picture and performing arts magic. Never before has the magic of the American circus been captured so brilliantly. As the movie stares, “a man’s station is truly limited only by his imagination.” From the costumes to the music and choreography, this film is sure to inspire anyone who has a dream and wants to realize it. The music will have you singing along, clapping, and even tapping your toes because the emotions will get you right to the core. Ordinarily, a movie like this could generate an interest in budding performing artists and showbusiness enthusiasts to “run away and join the circus,” but the big top had its swan song earlier this year. One can only speculate that had this film been released last year that the circus that still bears his name Ringling Bros. and Barnum & Bailey would still be touring today. Sadly, the circus had its final performance in May 2017. From the moment the movie opens, you will be completely immersed in the world of P.T. Barnum, a world unfamiliar with the concept of shows that were sheer spectacle, illusion, and simply designed to put smiles on faces. It’s entirely possible that this may prove to be the greatest films of 2017, and certainly one of the greatest movie musicals ever made. Simply stated, The Greatest Showman is the film adaptation of the life of P.T. Barnum (Hugh Jackman) and depicts how he was inspired to essentially create the very concept of showbusiness. From his successes to his failures, this movie showcases the very beginning of the American circus, a tradition that would last for nearly 150 years. Filled with incredible original music, this original movie musical displays how one man’s vision became a worldwide sensation. My first observation of this film is just how polarizing it seems to be. On one hand, some critics and websites praise it for being an absolute delight while others are rating it rotten. Unapologetically, I feel strongly that this film musical is nearly flawless. As to how accurately it reflects the life of P.T. Barnum, I cannot speak to that because I have not spent hours researching his life; however, from what I do know about him, the movie seems to have captured the inspiration and vision accurately, as well as his faults and pitfalls. While standard holiday issue biopics are nothing new, what with The Darkest Hour also on the horizon this season, Gracey turns what could have been just another biographical film about an American icon into a larger than life dazzling display of precise choreography, effective montages, and just plain fun! Ringing Bros. may have closed the bigtop for the last time, but the soul of P.T. Barnum lives on in what Feld Entertainment (parent company to Ringling Bros and Barnum & Bailey) does. Without P.T. Barnum, we may not have the concept of showbusiness as we know it today. Despite staying away from the usual meaty themes found in Christmastime biopics, this film packs a powerful punch and supports the need for entertainment and the arts in our lives. The high degree of passion Jackman displays for his character cannot be overstated. Though Gracey shows his directing prowess in this film, it is the labor of love of Jackman who has been trying to get this movie musical made for the better part of a decade. While the cliche underdog story may not be anything new, the method through which the story is told is a must-see spectacle. What works best in the movie are the extravagant and intricately choreographed musical numbers. 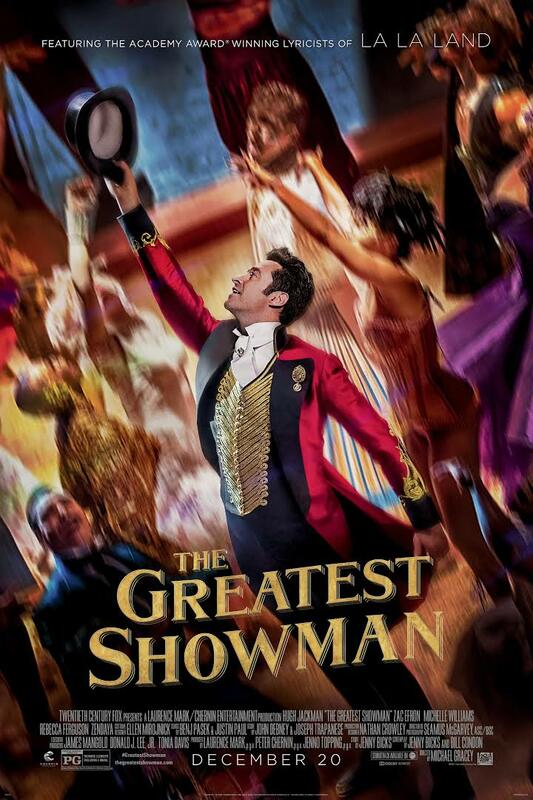 The infectious and inspirational songs of The Greatest Showman were written by La La Land Oscar winners Benj Pasek and Justin Paul while the brilliant choreography was staged by Ashley Wallen. Each and every musical number is powerful and truly adds to the fantastic experience of this film. Moreover, this movie musical typifies the height of the visual and performing arts in terms of the ability to create an imaginative atmosphere that generates sheer delight in the minds and eyes of the audience. In many ways, this movie is an extension of the circus that many of us grew up watching as kids and even adults. The circus was never about deep, complex stories; it was about entertaining audiences of all ages and bringing smiles to faces. And this film will certainly bring joy into your life this holiday season! Such a perfect movie for the week leading into Christmas because it is fun for the whole family.